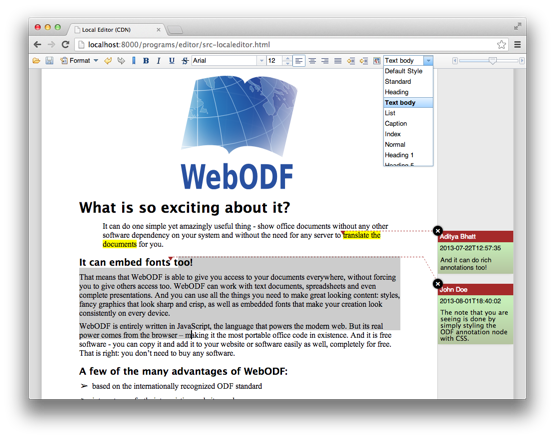 Editing a text document with the WebODF Editor. Check out our demos and see what apps and other features are available. WebODF is a Free Software project. All code is available under the AGPL. This means that you can use the code free of charge, investigate how it works, and share it with others. If you are interested in using WebODF in your commercial product (and do not want to disclose your sources / obey AGPL), contact KO GmbH for a commercial license. This is a bugfix release that fixes an urgent issue. WebODF now makes absolutely sure that the mimetype file, which is used by many applications and some operating systems for identifying the mimetype of ODF files without having to depend on filename extensions or mimetypes, is not compressed within the ZIP container. So go to the Download page and update your deployment of webodf.js or the Wodo.TextEditor. Or check the demos (general, features). The project WebODF has been awarded with the third price in the Open Source Business Award 2014 (OSBAR), selected out of 17 nominated projects. The OSBAR is an innovation award by the Open Source Business Alliance. It was given in a ceremony today at the Open Source Day in Hamburg, Germany. Put webodf.js on your web server. Put your OpenDocument files on your web server. Add a small snippet of HTML to your web page.